About LAWs of Golf – No two golfers are built the same, have the same abilities or backgrounds. 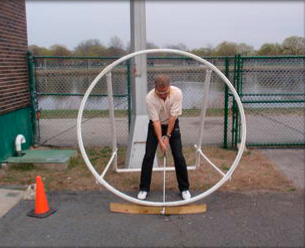 LAWs of Golf was developed based on this knowledge and enables each golfer to develop his or her own customized swing, based on their unique characteristics. The system and the drills associated with it, allows each person to find his or her own perfect posture and grip, stance width, ball position, swing plane and swing length and as a result maximize their play and enjoyment of the game. LAWs begins with three swing models: Leverage, Arc and Width. These models and the corresponding teaching models are the culmination of many years of research, observation and trial and error. Each model describes a set of general characteristics and tendencies for that particular group. Leverage golfers are most likely to have average to above average flexibility, an average chest size and arm and leg length proportional to their body size. Arc players are most likely to have above average to excellent flexibility, be unusually tall and have long legs and arms. Players with a thicker chest and shorter arms and legs with less flexibility are generally width players. The key for every player is to match the timing and speed of the hips and the hands so that they are in the proper position at impact. Drills based on these LAWs of Golf have been developed that include putting, chipping, pitching and bunker drills as well as the full swing. As a result, the LAWs of Golf has allowed numerous players from beginner to tournament player to customize their game.